Gardenality Stem · Zone 9B · 25° to 30° F · 882 Points · Last Login 7 years ago. I love gardening and spend as much time in my garden as I can. I am always creating new gardens and plan to have very little lawn to mow. I live in a cherry orchard and my garden is quite large. 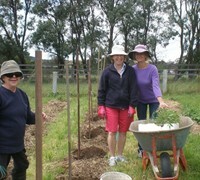 I am also the coordinator of the Tenterfield Community Garden a project run my the local TAFE and the local Landcare group. Below are plants that grow in Jennifer Savins's virtual gardens. The larger the plant name, the more Jennifer Savins uses it.